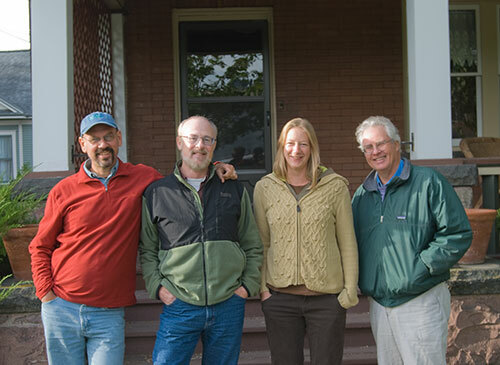 The Western Watersheds Project has opened its Montana office. About 50 enthusiastic folks attended the word of mouth opening last night in Missoula. Montana operations will be run by attorneys Tom Woodbury and Summer Nelson. Woodbury has a number years’ experience in Montana and Idaho conservation battles and Nelson is a new graduate at the top of her class at the University of Montana law school. The WWP Board was represented by executive director Jon Marvel and myself. Those attending came as far as Helena with tales of livestock operator abuse of land and water and lack of action by old line Montana conservation organizations. Enthusiastic welcomers expressed strong sentiment that Montana’s federal and state agencies need a wake-up call (or kick). Things are not going to proceed as usual at neglected BLM and Forest Service offices in the states. This a major office for WWP, larger than any but the Idaho office. WWP also has offices in Western Idaho, Central Idaho, Hailey, Idaho (main office), Utah, Wyoming, Arizona, and California. In front of the new Montana WWP office. This is good news indeed. It seems that managers’ regard for the public environmental interest has a way of atrophying without public willing and able to insist on it. Montana seems to have been a state that’s fallen through the cracks in that regard w/ Livestock issues – until now. WWP has already submitted some pretty strong appeals, protests, comments, and managers have already had the opportunity to experience that first shot of Marvel’s unique method of persuasion. One BLM office didn’t even appear to have known what a submitted request for “Interested Public” status was – another didn’t know which BLM Solicitors Office public ought submit appeals to. By this time next season a lot of them will be thoroughly versed in such things – especially if their EAs keep coming out the way they have been. This will be good for Montana’s wild lands and wildlife – including bison, grizzly, sage grouse, pygmy rabbit, brewer’s sparrow, wolves, cutthroat, bighorn, fluvial grayling, sturgeon, etc. etc. etc. I agree, Brian………the “good ole boy” non-profit network in Missoula has stagnated. I’s a breath of fresh air to have groups like Western Watersheds and Center for Biological Diversity opening offices here. The ‘old line” environmental orgs just plod along accepting the status quo. “Don’t rock the boat” is their motto. Maybe it’s because so many of the non-profits hire people within the state that went to school here and had the same profs with the same philosophies. Many of their schoolmates go to work for either FWP, BLM or the FS……it’s difficult to take a stand against your buddies. Diversity and new ideas are lacking. Maybe having a couple of new groups like this will wake them up. That is really good news. I understand BLM in Montana s still trying to annihilate sagebrush. Isn’t there a proposal right now to spray diesel and herbicide, or some such horrid thing, on sage-grouse and pygmy rabbit habitat – in order to promote welfare cattle grass? I am so excited about this! I think the lives of some bureaucrats are going to change soon.